December 3rd, 1994: A day that will live in infamy. Fifteen years ago today, the little gray Sony PlayStation hit shelves in Japan, introducing a powerful new player to the console arena. It really is kind of breathtaking to consider exactly how far the industry has come in such a short amount of time. Today we have games that are mind-blowingly close to photorealism, and despite its recent difficulties in the market, a person would be a fool to say that Sony isn't a major player in the console race. But a mere decade and a half ago, Sony was a newbie going up against established contenders like Sega and Nintendo, CDs were just starting to be used in lieu of cartridges, and the state-of-the-art graphics... well, they looked like this. Sony might have been a bit player when its unassuming PlayStation hit shelves in Akihabara fifteen years ago, but to say the device "took off" would be a bit of an understatement. 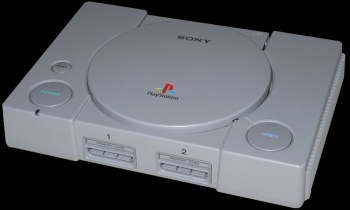 Within a year, the console had launched in both North America (September 9th, 1995) and Europe (September 29th, 1995) and proved to be as popular in those markets as it had been on the other side of the Pacific. Sony roared past Sega and Nintendo, leaving the Saturn and Nintendo 64 coughing up dust, and went on to dominate the console market for not just one but two consecutive generations. The PlayStation gave us Resident Evil, Symphony of the Night, Metal Gear Solid, and Final Fantasy VII - as well as roughly a bazillion other games that we fondly revere as classics nowadays. So yes, today was a landmark day in gaming history, and the industry has never been the same since. Happy birthday, PlayStation.